Senator Orrin Hatch speaks to reporters after meeting with U.S. Secretary of the Treasury Steven Mnuchin and Director of the National Economic Council Gary Cohn and Republican law makers about tax reform on Capitol Hill in Washington, U.S., September 12, 2017. WASHINGTON - The U.S. Senate’s top Republican on tax policy warned on Thursday that the “Big Six” tax negotiators from the White House, Senate and House of Representatives would not dictate the direction of expected tax reform legislation to his committee. In a defiant statement issued at a time when top Republican policymakers from the Trump administration and Congress are preparing to unveil their tax reform framework, Senate Finance Committee Chairman Orrin Hatch said his panel would not serve as “anyone’s rubber stamp” and said his tax legislation would reflect the consensus views of panel members. 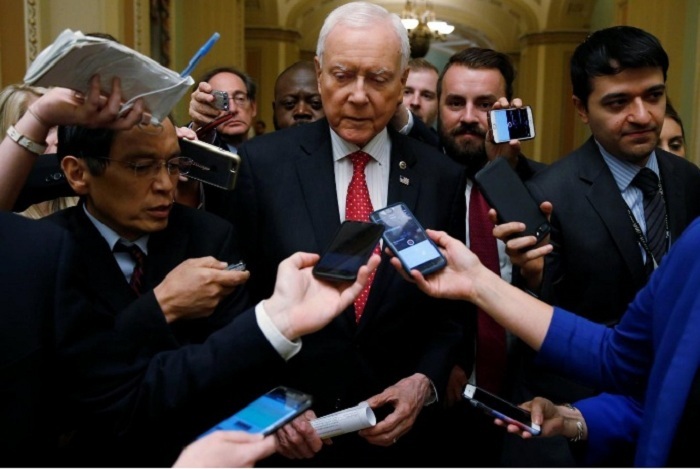 “Leaders in the House and Senate, including myself, as well as officials from the executive branch have been discussing various proposals,” Hatch said in a statement at the outset of a tax reform hearing. “The group – some have deemed us the Big Six – will not dictate the direction we take in this committee,” he added. Hatch’s remarks appeared to signal a parting of ways from the unified approach the White House, Senate and House have been pursuing for months. House Republicans announced on Wednesday that a new tax reform framework would be unveiled on Sept. 25. Hatch is a member of the Big Six, which has spent months in closed-door meetings trying to forge an agreement on how to proceed with tax reform. Other members are Senate Republican leader Mitch McConnell, House Speaker Paul Ryan, Treasury Secretary Steven Mnuchin, White House economic adviser Gary Cohn and House Ways and Means Committee Chairman Kevin Brady. The Senate Finance Committee and the House Ways and Means Committee are the two tax-writing panels in Congress. They are expected to unveil legislation in coming months as President Donald Trump and congressional Republicans seek to overhaul the U.S. tax code by year end. The U.S. Senate’s top Republican on tax policy warned on Thursday that the “Big Six” tax negotiators from the White House, Senate and House of Representatives would not dictate the direction of expected tax reform legislation to his committee.